Online fax services make it possible to fax without a machine, which can save you time and money and make it easier to fax from just about anywhere. If mobility is one of your top criteria when selecting a fax service, there are several that offer mobile apps that let you fax – and even scan documents – from your phone. If you see a service you like here, make sure to check out the deals that fax providers offer exclusively through this site. These providers make faxing apps that will work with iPhones as well as the Android and Blackberry platforms. 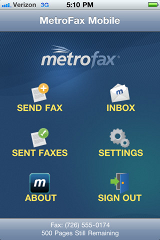 MetroFax’s mobile app is available on iPhone and Android. The features are fairly robust. You can send faxes of images taken with your phone’s camera, or of files and photos already stored on your device or housed in cloud storage services, such as Dropbox and Google Drive. The app lets you add fax recipients to your contact list and confirm all the details of your fax before sending. It also keeps a log of all fax activity. 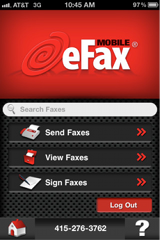 MyFax has a mobile application for the iPhone only. Key features of the MyFax iPhone app include the ability to send faxes of documents created on your phone, images from your photo album, or documents that you’ve scanned into the app with your camera. You can add fax recipients manually or select them from your contact book. Additionally, you can view the status of your sent faxes and received faxes with the app. eFax offers mobile apps for both the iPhone and Android operating systems. With the eFax phone app, users can create and send faxes by scanning documents with their phone’s camera. This app lets you add a cover sheet and fax to contacts stored on both your device and your eFax contact book. You can also view and search received faxes. You can even digitally sign documents and fax them without having to print, sign, and scan your documents back into your online fax account. 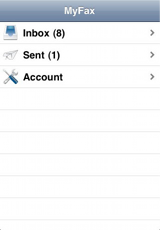 MaxEmail’s mobile app is available for the iPhone operating system. The app lets you fax by scanning images, uploading pictures from the camera roll, or attaching PDF files directly from DropBox, Google Docs/Drive, iDisk or any WebDav storage service. You can receive faxes and voicemails to your mobile number and view the sent and received history for the past 30 days. Sfax’s mobile app is available on Android and the iPhone. 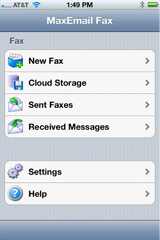 Features of the Sfax app include the abilities to view, send, and receive faxes. You can scan images, select a cover sheet, and add notes to the documents. Get real-time fax status updates and access contacts saved on your Sfax account through your smartphone. The Sfax mobile app also lets you receive voicemails. The app also works on the iPad. Popfax’s mobile app, dubbed “Popcompanion” is available for all three major mobile platforms: iPhone, Android, and Blackberry. 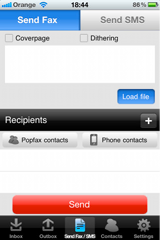 With Popcompanion you can view, download, send, and receive faxes. 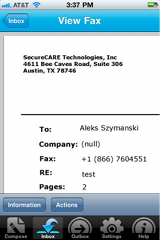 You can also forward faxes to email and personalize faxes with a cover page. Additionally, Popcompanion will let you manage personal contacts that are saved to your Popfax account. RingCentral customers use the same app whether they are fax only only customers or they also use hosted phone services. 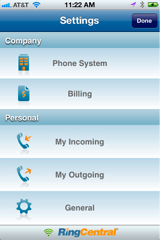 As a result, the app is very robust and includes call management features as well as Dropbox and Box integrations. Users can receive, view and send faxes, choose their cover page style and send to their RingCentral address book or their person contacts using the app.